The mark of a good wingnut is to never take responsibility for the harm their cohort inflicts on society. It really doesn’t matter what the bodycount is, or how close to home it is. For them, the ideology is all that matters, even if [as it so often is] their ideology is not only rotten but also easily disproven by a semi-literate child. but blames Jacob’s death on his own alcohol and drug abuse and eating disorder. Don’t blame the people who feed anti-gay discourse into society [people like F.A.C.T. ], blame liberals! Blame everybody else! Rep. Ragan: product of the Tennessee public school system right here. Also gay. The fact that you have a position of power is part of the reason the rest of the developed world makes fun of places like Tennessee. The fact that you would suggest, based on absolutely no factual knowledge of your own, that Jacob’s “proclivities and behavior” led him to suicide, essentially that you would blame Jacob’s sexuality, something he had absolutely no control over, for his death, is the epitome of callousness and petulant Southern hick ignorance, sir. While this is behavior I fully expect from members of Tennessee’s legislative body — I mean, come on, we’re not exactly known as a first world state — it’s particularly saddening, in an age where we all have Google and iPhones, that you remain so blissfully unaware of the world around you, and that you value your own bigotry more than you value Tennessee’s children. 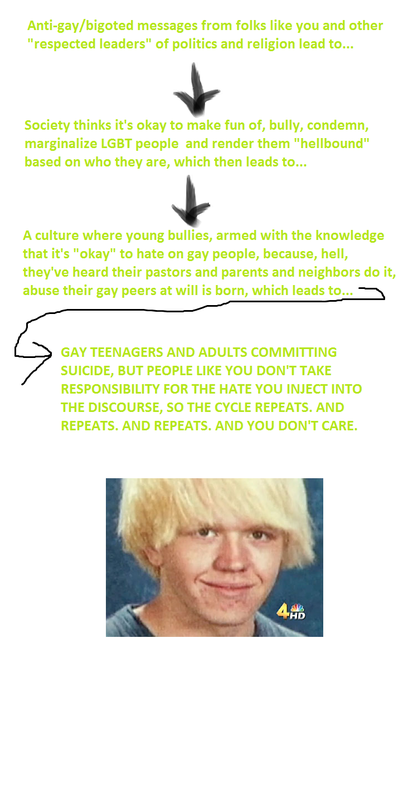 Yes, it is true that Jacob was bullied for being gay, which led to his suicide, but let me draw you a picture* of the chicken and the egg in this situation. So, that is how it works, Rep. Ragan. Plan your future statements and actions on this issue accordingly. Oh wait, you won’t, because, as the piece points out, kids like Jacob aren’t what you’re trying to protect. Blaming the victim is necessary to prevent Jacob’s death from damaging chances for passage of F.A.C.T.’s 2012 state legislative priority—a bill to make it easier for young bigots to bully gay schoolkids. This legislation brought by conservative Christians who oppose special protections for gay people actually gives special protections to homophobic bullies.